The 2 Days productivity iPhone and iPod Touch app is a handy, virtual notepad ready for you to scribble in a task, establish a reminder, and quickly mark it off. It is an iOS productivity app free of tags, categories, and the need for a silence period adjustment in your notifications. The 2 Days iPhone app is a bright, white notepad with menu bars for navigation at the top and bottom of the screen. You select today, tomorrow, or the completed task log from the bottom of the screen. If you need to add a task to today’s list, you touch today and your list appears. You simply add a task by touching the plus icon. A keyboard appears for you to type your task or reminder. After you touch done on the keyboard, it is added to your list. As tasks accumulate for each day, a red number notification lets you know how many items you need to accomplish. When you complete a task, you touch the box next to the item. It is removed from your day’s list and placed in your completed task log. You will appreciate that each accomplished task or reminder is moved off the screen. 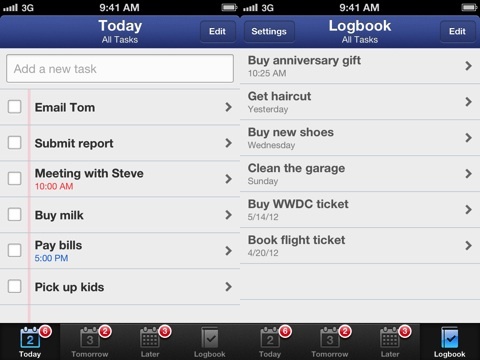 It frees the visual clutter frequently part of iOS to-do list apps, so you can focus on the next task at hand. 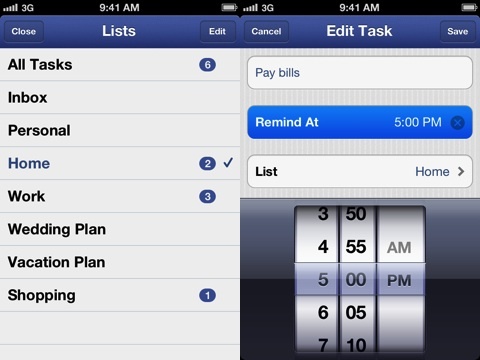 The 2 Days iPhone app incorporates excellent, easy interface for creating pop-up reminders. You touch a task, and you can select a specific time with agile gesture controls. You can also choose to move the task between the two days–today or tomorrow. If you have a task you just need to keep putting off, then you can in just a few simple touches on the screen. 2 Days is a reasonably priced $0.99 download from the iTunes App Store. It replaces the strings of post-it notes you move from your computer screen to your car dashboard to the kitchen counter. The 2 Days iOS productivity app provides an uncomplicated approach to dealing with life’s complications. AppSafari review of 2 Days was written by Jenni Ward on June 28th, 2012 and categorized under App Store, Calendar, Featured, Notes, Productivity, Utilities. Page viewed 5046 times, 2 so far today. Need help on using these apps? Please read the Help Page.